So read the January 18 1934 Lubec Herald. The newspaper reported an earlier blizzard on December 26-27 in its issue of the 28th, with temperature falling to -24 degrees at some points. But after the first of the year conditions improved rapidly. “It seems like winter is over,” wrote the January 11 issue on page 1, noting 40-45 degree temperatures and pussywillows reported out in South Lubec. Then the blizzard descended, and went, leaving Main Street in this state near the Columbian Store. 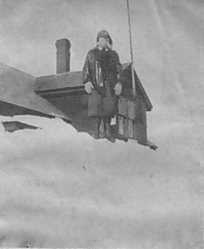 The big blow struck Saturday night, January 13, and “completely filled in the streets and highways.” Town officials ordered “a general alarm blown on the fire whistle to call out all available men in town to help shovel the streets.” On Tuesday 40 high school boys assisted 100 men. People revel in weather extremes, and eagerly document their suffering with photographs. The January 11th Lubec Herald also reported that by Tuesday the 16th North Lubec Road was opened to horse traffic. The following week’s edition of the newspaper on January 25 reported that the town had appealed for outside assistance. The New Deal’s Public Works Administration responded, and the governor ordered a State snowplow out to Lubec. “Driving pelting rain” on Tuesday January 23rd, along with temperatures above freezing, reduced the accumulated white stuff a foot, leaving the streets ankle deep in cold water. The blizzard’s aftermath resonated in headlines throughout New England. On February 1 the Herald quoted a January 21st Boston Globe headline, “Food Fast Vanishing in Snowbound Town.” The Globe wrote that Lubeckers were cutting down their fruit trees to keep neighbors from freezing to death and that “business was at a standstill.” However, that February first Herald calmly clarified that “none of the stores has been closed, and none...have been cleaned out of foodstuffs.” Two dealers S.B. Stuart & Co. and the Columbian Packing Co. had good supplies of coal, and wood on hand. Coal experienced no advance in price. By the way, that state snowplow opened the road, later Highway 189, all the way to Whiting, linking to Highway 1 and ending the storm-imposed isolation. The Lubec Herald documented the expenses in its April 12th edition. 1933 snow removal had cost $440.80, leaving a balance in the budgeted $500 from town funds and $287.16 from the state. But 1934 cost $8992.40. Snow removal during the1933 season received one page in the annual Town Report. But 1934’s account required a separate 28 page publication.